Guess what? I'm obsessed with Disney. Did the blog give it away? Or the closet full of t-shirts? Well, the monkey's out of the bottle now. In my obsession with Disney, I've tried to make it the centerpiece of my life. I worked at Walt Disney World for seven months, I created this blog, and I'm trying to get them to let me make magic full time. If it doesn't happen now, it will. Going along with that theme, this semester, just about every big project I've had has been about Disney. This has been a running theme of my college career, having started this very blog in my online media class. My course load has consisted of a media production class, a graphic design class, a class on the future of journalism, a class on business journalism, a photojournalism class, a one-credit class on the FOX company (so not Disney! Oh, but wait) and an advanced online media class. I've managed to make the first two big assignments for my graphic design class Disney centric. 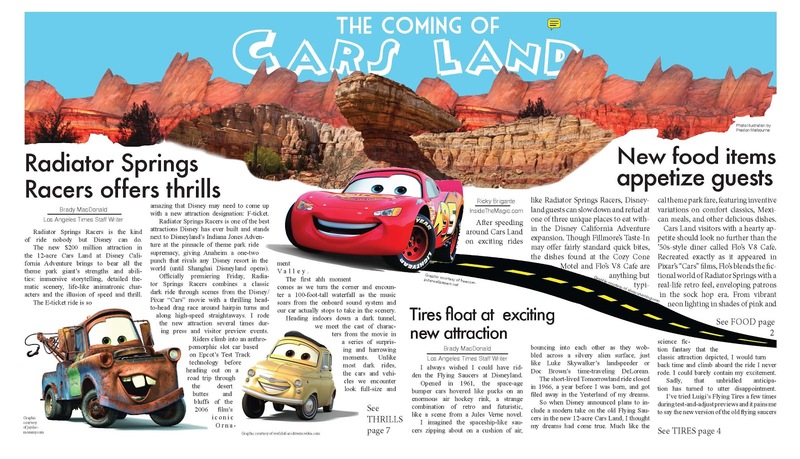 The first, a magazine layout, was done on the opening of Cars Land. 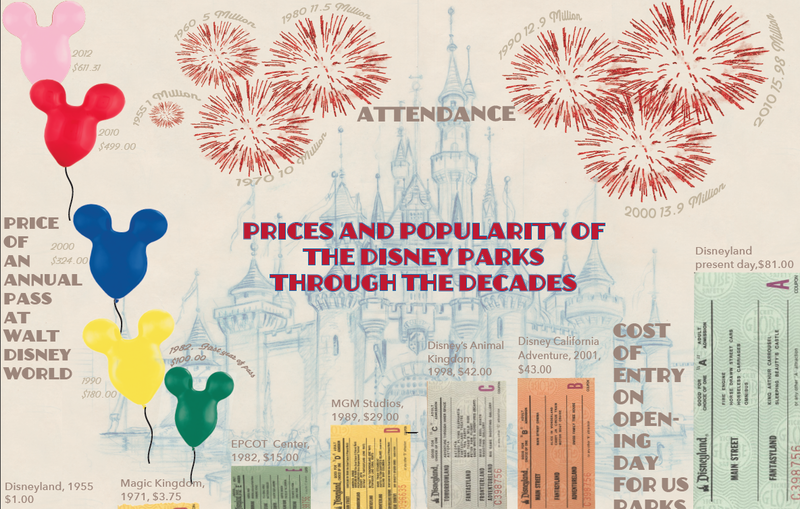 The second, an info graphic, was done on the prices and popularity of Disney. I don't know what my grade is on the ladder, but I only got four points off out of 200 for the former. Ka-Chow! it that attracts Disney to what many see as the child's entertainment company that is Disney. For my media production class, I did a fake podcast on the Disney parks. That didn't go so well. But I got my Disney in! 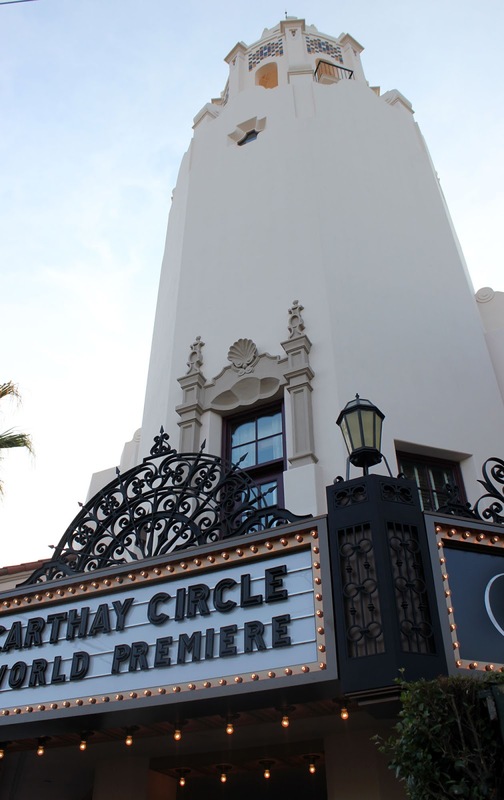 For my photojournalism class, I turned in a picture I took on my recent trip to Disneyland of the new Carthay Circle Theatre. With my future of journalism class, I'm turning in this blog, and a composite video I made for the two components of the final. Most of my grade for the class will be decided on things having to do with Mickey Mouse. Then there's my class on FOX. How'd I do it? Well, I haven't yet. But I am going to write a (fantastic) paper comparing Walt Disney to Rupert Murdoch. My conclusion, I can tell you, is that they're two very different people. Oh, and this is my senior year, and every credit counts towards graduation. So, you could say with my college career, "It all ended with a mouse."